Gwendolyn Epps Pharr is an assistant professor of history at Norfolk State University in Norfolk, Virginia. Her master’s degree in history is from Carnegie-Mellon University in Pittsburgh, Pennsylvania and her bachelor’s degree is from Norfolk State University. She has done further study beyond the M.A. at Carnegie Mellon University. A native of Norfolk, Virginia, she is currently doing research regarding Norfolk during the era of Virginia’s “massive resistance” efforts which were in reaction to the 1954 Brown v. Board U.S. Supreme Court decision. 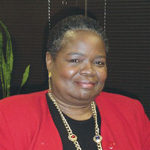 Her teaching specialties include African American history, American history and Virginia history. Additionally, she serves as the History Department’s coordinator for its secondary social studies program and consequently serves as university supervisor for secondary social studies student teachers. For the last several years Pharr has periodically served as a consultant to two area public school systems helping teachers broaden their knowledge of African American history and assisting them in incorporating African American history into their existing American and Virginia history courses.